OVERVIEW: The World of Terrorism has established new targets to get worldwide attention. It's your children's local school. It's your children, or your grandchildren, or your loved ones who go to school each day thinking they are safe. While the world of anti-terrorism circles around financial institutions and government agencies, the Terrorists are mapping out a new tactic--walk into your local school with bombs and bullets and be prepared to kill all the children. Who will stop them? Are you ready to stand up to Terrorists in your neighborhood who will kill children to make a point? Find out how you can defend your children's schools today. GROUND ZERO PLUS 1090 DAYS (7 DAYS TO GROUND ZERO PLUS THREE YEARS)--New York, NY, Saturday, September 4, 2004--I feel sick to my stomach as I watch the news unfold about the killing of children in a Russian middle school. As of this date, some 250 have been reported killed. Another nearly 100 are on the grave list. In the end, the numbers may soar. There were some 1,200-1,500 parents, teachers, school staff and children in the School No 1 in Beslan, one of the bigger towns in the tiny province of North Ossetia, southern Russian, celebrating Learning Day, traditionally the opening day when the masked Terrorists, heavily armed and laden with bombs, took command of the school and threatened to kill scores of students if any of the Terrorists were shot. They planted bombs throughout the building and herded the children and adults into a gymnasium, not allowing them any food or water as the siege grew explosive. As ambulances arrived to ferry dead bodies from the school when some twenty were killed in the initial seizure of the school, explosions were reported. The Terrorists had wired explosives in the gym and throughout the building. The hostages began to flee. The Terrorists reportedly began shooting them in the back. The Russian forces opened fire. Bombs and bullets singed the air, creating a wall of lead and a pile of dead--mostly children. The gymnasium roof collapsed as explosives sent it crashing down, burying and burning to death countless children and adults. The acrid smell of burning flesh seared nostrils as gun smoke fogged the sweltering afternoon. In the end distraught mothers frantically searched for their sons and daughters. They tore off the sheets covering the dead looking for their loved ones. One mother found her daughter dead beneath a sheet, knelt, sobbing, and kissed the child's forehead. Seven days from now the reality of thousands of children's screams will be heard by those of us who know the inner workings of FAMILY TERRORISM. 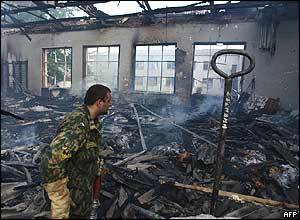 On September 11, 2001, instead of a school in Russia, buildings in the United States were attacked by Terrorists who flew suicide bombs into them. A total of 2948 people died in the Twin Towers, the Pentagon, and an ill-fated crash of a jetliner headed toward the White House. These were mothers, fathers, grandparents, uncles, aunts, cousins, nephews, nieces, brothers and sisters. Immediate family members for each victim represents a least at least ten pods--two parents, two grandparents, two children, two brothers, two sisters--at the minimum. That creates at least 29,480 direct family victims of the deaths of Nine Eleven. 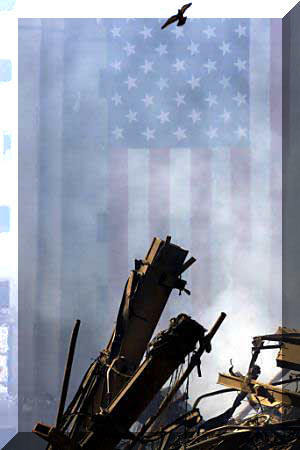 The tears that flowed that day will flow again on September 11, 2004. The 29,480 direct family members will kneel symbolically and kiss the foreheads of their mothers, fathers, grandparents, uncles, aunts, cousins and loved ones just as the Russian mother knelt and kissed her child's cold, lifeless forehead. Statistically, when someone dies, the average attendance at a funeral is estimated to be 250 people. This includes friends, associates, loved ones with whom a person has created some lasting relationship with over the course of his or her life. Multiplying the 250 "Related Family" members by the deaths of 2,948 expands the suffering of loss to 737,000--nearly three quarters of a million people directly impacted by the loss of someone they cared for enough to personally grieve at their funeral. This does not include, of course, the hundreds and thousands of others who felt a kinship with all those who died that day. I have a special relationship with all the deaths of Nine Eleven. I was there that day, watching as people leaped from the burning buildings, soaring through the air on their way to certain, sudden death. With each body plummeting to the earth, those of us craning our necks sucked in a deep breath and enjoined our souls with those about to die, as though we were in some mystical way joining them on the last flight of life. When each body hit the earth, there was a deep groan, an inner cry of pain from us that was like a knife in the soul. It was as though we lost something dear to us, even though the figure falling was a mere dot in the blue sky, arms flailing, face unrecognizable. Yet, we knew each one who tumbled down, as we might know a mother, father, brother, sister, cousin, nephew, niece. Hundreds of people died that way that day. Some held hands as they leapt, similar to the scenes of the Russian children running hand in hand, half-naked, from the burning school, hoping the Terrorist sniper wouldn't shoot them in the back as he had others who tried to escape the holocaust. Then the final moment came on September 11, 2001, as it did on September 3, 2004 in Russia. The World Trade Center collapsed. The buildingcrashed down from a quarter mile high in less than ten seconds, imploding on itself, burying thousands in the rubble of twisted steel and concrete. In Russia, the roof of the gymnasium collapsed as explosives undermined its structural integrity, raining down upon the fragile bodies of the children deadly beams of steel and wood, and charring their bodies with flames and choking their lungs with deadly smoke. Hopefully, they died quickly, but fire is an ugly creature. I shudder to think how many were tortured by it before their consciousness was extinguished by the pain. As America approaches the anniversary of Nine Eleven, the horror of Terrorism creeps closer not farther away. A new standard of horror has been established for Terrorism. Since Terrorism seeks solely to inflict Fear, Intimidation and Complacency into its victims, what better tool than to kill defenseless children in schools to accomplish this goal? A radical Terrorist looking to make a mark on the world may divert his or her attention from a subway or financial institution and focus now on a crowded school where there is no security, no protection against a band of Terrorists taking it over. Historically, children have been off limits for Terrorists. That's what makes me sick to my stomach. Who will protect the children from Terrorism's harm? The world stands by and ignores the children as the key to Terrorism's power. Instead of ringing Sentinels of Vigilance around our children, we protect our banks and financial centers and our political leaders while the children walk naked. This sharpens the need for each household in America and the world to take the Pledge of Vigilance and to become a Sentinel of Vigilance. Only the families of the community can do that, but they must become a militia of Vigilance. 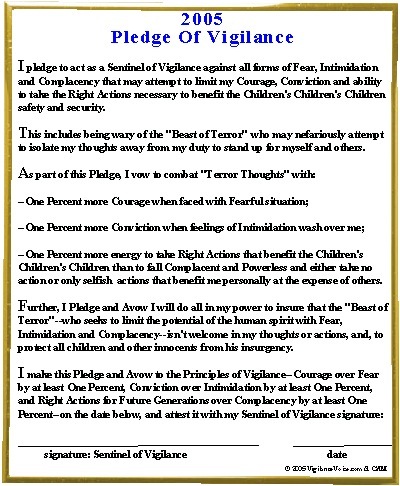 They must take the Vow of Vigilance and be prepared to thwart any and all attacks on the children--whether they be physical or emotional. "How did this happen? Where was our protection?" 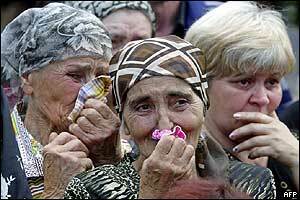 One of the Russian women, a mother, cried out before the Terrorists blew up the school: "How did this happen? Where was our protection?" American parents will cry the same song when the Terrorists take over their school, threaten their children. But it will be too late, as it was in Russia. Offense rather than Defense is called for today. If we are going to learn anything from the Sentinels of Vigilance who died on September 11, 2001, as well as the hundreds of new Sentinels of Vigilance who died in Russia yesterday, September 3, 2004, we must learn to assume the role of Parent and Citizen of Vigilance today to drive away the aspirations of the Beast of Terror that we are "unprepared" to withstand his attacks. Switzerland, a small nation of some six million, sleeps peacefully at night because every citizen is a Sentinel of Vigilance. Each has in the home weapons and is trained in the militia. Every one is a Warrior of Vigilance, able and trained to protect the children with their lives. They do not rely on government to protect them--they are the government. America and the world needs to have Vigilance under their children's beds. The Beast of Terror is real and is ugly and will kill children in a blink of an eye because by doing so the people will scream in Fear, Intimidation and Complacency. But, if one is a Citizen of Vigilance, a Parent of Vigilance, a Loved One of Vigilance, that power to stand up to Terrorism is like a flack jacket. Terrorism cowers in the presence of such Vigilance for it cannot gain any foothold in Fear when Courage is stronger, or stack the deck with Intimidation when Conviction trumps it, or deal Complacency off the bottom when Right Actions for future generations keeps a Vigilant eye on the hands. How many children have to die before we realize that we--the Citizens of Vigilance--must defend our own? 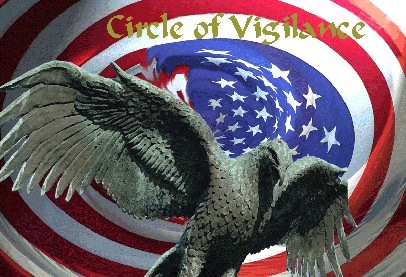 We have a Circle of Vigilance around Ground Zero in America. It is not a graveyard or a memorial as so many want to make it. It is a living reminder, a beacon, a legacy of learning that continues to remind all who have the foresight that we cannot bury the dead. We must not let the memories of those who died be eaten by the maggots of time and the ravages of Complacency. The Sentinels of Vigilance never died. They remain alive and well, hovering over Ground Zero, whispering to those who have ears to hear: "Semper Vigilantes....Semper Vigilantes..." Always Vigilant. Always Vigilant. Now, they have hundreds of new Sentinels of Vigilance to join them. They are Russian children, parents, teachers and loved ones who died the other day. They join the Circle of Vigilance and whisper in chorus: "Semper Vigilantes...Semper Vigilantes..."
If you cannot hear them, then you need to unplug your Complacency. 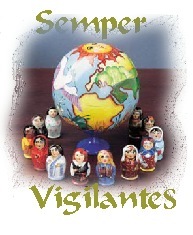 Tune in to the Sentinels of Vigilance and hear the Russian children sing to you....."Semper Vigilantes"
To tune in to the Sentinels of Vigilance, take the Pledge of Vigilance and each day renew your Vow of Vigilance. When you do, you will hear the Voices of Vigilance, and the song of the Russian children singing to you..."Semper Vigilantes...Semper Vigilantes.."
And most of all, you will hear your children and loved ones better...for they will know you are their Sentinel of Vigilance, one who doesn't wait for government to do what a parent should. Go To Yesterday's Story: "The Evolution Of The Vigilance Revolution"